A quartz crystal chronometer is a clock that uses an electronic oscillator that is regulated by a quartz crystal to keep time. This crystal oscillator creates a signal with very precise frequency, so that quartz clocks are at least an order of magnitude more accurate than mechanical clocks. It is completely solid state and crystal controlled. 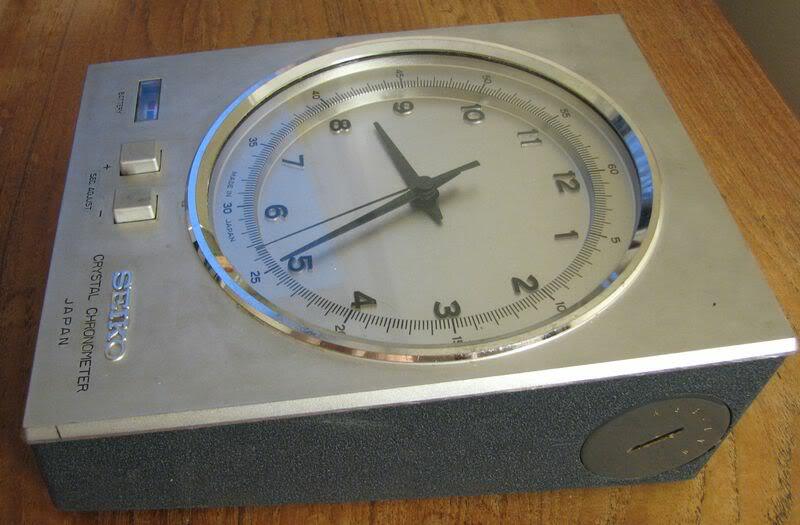 Quartz Chronometer (QC) is normally powered by a 5 volt, leak-proof AA alkaline with an average life of one year, the battery condition is shown by a indicator..
QC is usually in analogue form with either 12 or 24hrs graduated dials. The seconds hand is made to move in 1 second jumps so that exact time can be read. What is principle of operations of Quartz Crystal Chronometer? The aim is to achieve a steady frequency of 1Hz, which signifies one second per cycle. When electric impulses are passed through quartz crystal, the crystal oscillates. If the frequency of the electric impulse is adjusted to equal the oscillation of the crystal, resonance is achieved. The final 1 Hz impulses pass through a control unit and move the seconds hand of the chronometer by low power and very small pulse length. The accuracy of the oscillations depends upon the quality of the crystal and variation of temperature. 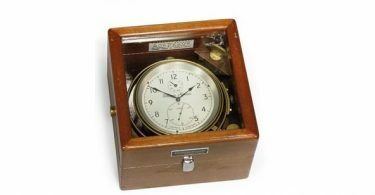 What are different controls of Chronometer? Setting of hours & minutes: Necessary only when initially setting up the chronometer or restarting it after a long stoppage (highly unlikely). 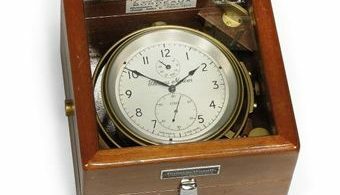 Resetting of Seconds hand: The knob should be pulled out and rotated as required ensuring that positions of the minutes and the seconds hand are perfectly synchronised i.e. When the seconds hand reaches 60, the minutes hand is positioned at a full minute. Frequency adjustment: Frequency of oscillation can undergo variation due to normal aging of the quartz crystal, which can result in an appreciable daily rate. This can be adjusted by turning a frequency control’ screw at the back with an insulated screw driver. One full rotation of this screw should cause a change of approximately 0.1 sec per day. Test socket: It is used to check the rate of chronometer. An Electronic frequency meter can be inserted in the socket to measure the final impulses to the second hand. This adjustment should be done at temperatures close to its Standard temperature. However they generally work best at about 20° C offering accuracy better than 0.02sec per day which may go upto 1.5sec per day in case of temperature variations. . In case of cold weather, an electric bulb inside the cabinet is kept on to maintain temperature. How to start the Chronometer against a Time Signal? Set the time of the next radio time signal by pulling and gently turning knob provided for this purpose. Await the time signal and, release the stop button. Check the error as soon as possible. Need no maintenance or lubrication. If any problem is encountered which can not be overcome by the external adjustment controls at the back, only the manufacturers or their authorized agents are competent to set it right. The dry cells must be renewed when they get weak or at the end of one years use, whichever is earlier. What are Advantages of Quartz Chronometer?